I can still hear the voice of my good friend and mentor, Bernhard Hack, in his thick German accent saying “These healing plants… we call weeds.” For a young conventional farmer, which I was back in 1982 when I first met Bernhard, this was a revolutionary concept. Weeds were simply a nuisance, something to get rid of with sprays. He introduced me to the notion that weeds had a purpose – a role in the agricultural ecosystem. As I stopped spraying and started observing weeds my thinking changed and I began to see the truth in his statement. Today, as I help to manage the co-existence of weeds and crops on our own fields, I look at my neighbour’s barren soil surface beneath the perfect rows of corn and soybeans, and I am more than ever convinced that Bernhard was right. Why does the soil bring forth weeds? We know that every soil is a veritable seed bank of weed-seeds which can last hundreds of years. Why such a mix of species and why are some dominant at certain times? The science of voluntary plant growth is not highly developed. Like all natural systems it is complex, involving many variables such as moisture, temperature, available nutrients, tillage practices. Everything the farmer does changes the ensuing weed profile. I’m not sure if there even is a science around this – the mainstream agricultural industry has long ago forgotten about weeds and focussed on better herbicides. The very first observation I made when I stopped spraying was that weeds don’t grow uniformly. Different parts of the same field, treated in the same way, exhibit very different weed populations. Also, if left unchecked, there will be a cycle of weed species. This seems to lend credibility to the theory that weeds grow as nature’s response to the needs of the soil. There are weeds that grow luxuriously in over-fertilized fields–pigweed being the king in that category. It probably got its name because it will take over where pigs were allowed to graze, leaving behind their excess of Nitrogen and Phosphorus. Good healthy Lamb’s Quarters are a sign that nutrient levels are good. In spring crops, wild mustard can grow either very large, like the biblical shrub, or small and spindly, depending on fertility and competition with the cultivated crop. 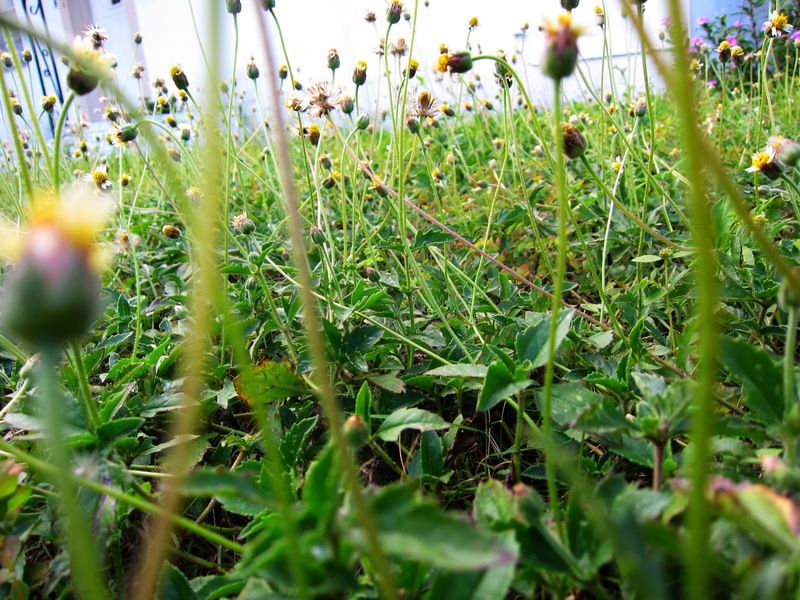 We can sometimes read about field conditions by looking at the weeds. Queen Anne’s Lace (wild carrots) will only do well in impoverished hayfields. Patches of Canada Thistle tell the farmer that the field needs to be rested with seeding down to perennial forage, pasture or hay. The organic farmer’s constant battle is to establish the crop he hopes to harvest and give it a “headstart” over the weeds. In general, we want to allow the soil to express itself with the necessary “healing plants”, but not to the extent that they overtake the crop we hope to harvest. More on this later. Right now I have to get out and hoe the potatoes! “Natural”… What does it mean?